Is Depression Among Your Auto Injuries? Did you know that depression or post-traumatic stress disorder might be included in the list of auto injuries experienced by many people after a car accident? You may have been feeling depressed but not considered it one of your auto injuries. Or perhaps you're experiencing debilitating anxiety or horrifying flashbacks from the accident on a daily basis. You may have thought the depression is your fault because you’re interpreting the collision from a negative perspective. You may right off your symptoms of PTSD since it indeed normal to experience some anxiety after an upsetting experience. There are actual studies reported in medical journals on the topic of depression and post-traumatic stress disorder after auto injury, especially whiplash injuries. A Canadian study in the European Spine Journal included 3,452 people who suffered whiplash and depression. Depression wasn’t their only symptom; it was one of several auto injuries experienced in their collision. Those who developed depression after the car accident had certain things in common. They were people who had severe pain in their neck or low back. Some of them had severe pain in their entire body. 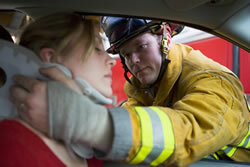 Others counted vision problems and numbness or tingling in their hands or arm as part of their other auto injuries. Some also noted prior mental health problems or poor general health. In the past, health practitioners believed that depression after a collision was “all in the person’s mind” and may have thought the patient to be a hypochondriac. After imaging studies were done on patients experiencing depression as one of their auto injuries, the doctors found that changes in the person’s brain could indeed account for why they had depression. Doctors are now including depression as one of many types of symptoms that occur as auto injuries. The Canadian researchers discovered that 51.7% of those with whiplash developed depression, with 11% of them developing it after the accident. Interestingly, the number one symptom that predicted who would become depressed after the collision was anxiety. Those who had anxiety were three times more likely to become depressed. When you get chiropractic treatment, you may notice a lifting of your spirits. Patients frequently mention to chiropractors that they feel better. Thus, if depression is one of your auto injuries, head on down to your chiropractor’s office for treatment of the whiplash and depression – just to feel better! Phillips, L.A., Carroll, L.J., Cassidy, J.D., and Cote, P. Whiplash-associated disorders: who gets depressed? Who stays depressed? European Spine Journal, June 2010; 19(6):945-956.